Retail real estate professionals were ooh-ing and aah-ing over Restoration Hardware’s 90,000 sq. ft. “gallery” in New York’s Meatpacking District at the ICSC show in early December. Now the retailer has staked out high-profile ground in Columbus. Steiner + Associates has announced that RH Columbus will be the retail highlight of its 16-acre expansion of Easton Town Center. This gallery will be a 40,000-sq.-ft., three-story, freestanding building. Like the Manhattan version, this RH will feature a rooftop park and café. Construction has begun on the $500 million expansion situated in the northeast quadrant of Easton Town Center, an expansion Steiner hopes will establish its keystone development as a bona fide community. The existing Town Center will be connected to the new area via the extension of Worth Avenue and the addition of Merchants Row. 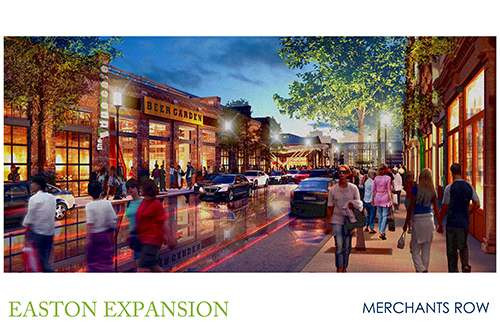 High Street shopping will be framed by a public green called The Yard and by Urban Hearth, a deconstructed industrial setting ringed by brewpubs, restaurants, and entertainment venues. “Continuing to evolve to what the wants and needs of the marketplace are is a critical focus for our development team,” said Jon Schmerin, managing principal of The Georgetown Company, co-developer of the project along with Steiner and L Brands.